Really happy with this cutting board. It's solid and stays put on the counter top when cutting. Looks good and sized perfectly for my needs. 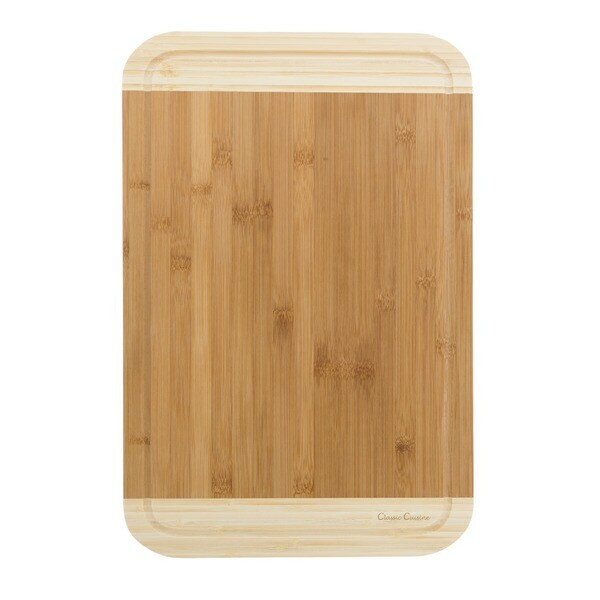 Easily chop, prep, and serve any meal or appetizer while maintaining an eco-friendly and sustainable kitchen with the stylish Two Tone Bamboo Cutting Board by Classic Cuisine. This .75 inch thick board is thick and durable enough to fit your cooking needs and is naturally crafted from bamboo which has antibacterial and antimicrobial properties. The set is a great accessory to take a healthy step toward a plastic and chemical free home! ECO-FRIENDLY - Crafted with eco-friendly bamboo, our cutting boards have natural anti-microbial and anti-bacterial properties which help to prevent cross-contamination of food and bacteria buildup. Bamboo is a renewable resource and is a more sustainable option, compared to plastic or hardwood alternatives! EXTRA THICK AND STYLISH - This two tone chopping board features different bamboo colors for an elegant touch, making it ideal for serving appetizers, cheese and charcuterie. The .75-inch thickness also helps to fulfill food prep needs in the kitchen- from slicing meat, to chopping vegetables, or even prepping garnishes for finishing touches on your meal. Truly a perfect gift for a housewarming, wedding, birthday and more! EASY CARE - The bamboo material is easy on knife blades and protects knives from dulling. The no mess juice groove around the board collects excess juice from meats, fruits, and vegetables to eliminate countertop messes and, when you are finished cooking, the cutting board itself is effortless to clean and simply needs to be hand washed with mild soap and warm water. SATISFACTION GUARANTEED - Classic Cuisine is committed to providing consumers with the absolute best price and value on our products. NOTE: This is an exclusive product of Classic Cuisine and ONLY Two Tone Cutting Boards by Classic Cuisine are GUARANTEED to be genuine. Very nice cutting board. Will last me years to come. Be sure to read how to properly clean this bamboo cutting board before you try to put into the dish water of dish washer.